On Saturday I turned thirty-seven, and if my birthday was any indication, the next year is going to be amazing. I really had a wonderful day. Since I had one of those coveted weekend birthdays this year I figured it would be only fitting for me to run a race. As you know, I just can’t say no to medal opportunities! So after searching for local races on January 9th I registered for the Southern California Half Marathon in Irvine. 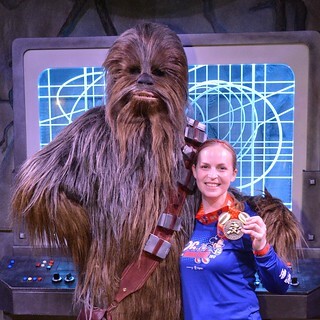 Due to the fact that I’d be running two Star Wars races at Disneyland one week later I would have preferred to find a 10K on my birthday because it would be less of a time commitment and much less difficult for my out-of-shape body, but I figured the half marathon would be OK. (I’ve never actually run two half marathons a week apart before, even when I planned to. Last year I skipped the OC half the weekend before the Tinkerbell half, and then the Wine & Dine half at Disney World was shortened to 6.7 miles the weekend before the Avengers half at Disneyland. Ask me again on Sunday if so little recovery time was a good idea or not!) However, the morning started with me not wanting to get out of bed to go to the race. It was my birthday and all I wanted was to sleep in! Fortunately I was able to drag myself to the race in just enough time to pick up my bib and get to the start line by 8 AM. And I’m so glad I made it because I ended up running my second fastest half marathon! For most people a time of 2:41:10 wouldn’t be impressive, but it’s less than two minutes behind my personal record (at the Avengers half in November). The course was flat, the weather was perfect, and I felt great (except for the last mile or so which was miserable for some reason). 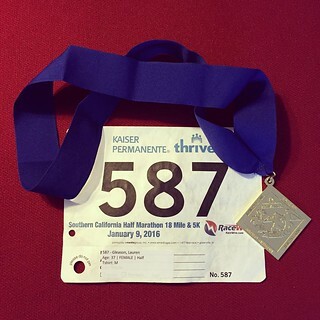 I must admit that the finisher’s medal for the Southern California Half Marathon wasn’t too exciting, but running that race was the best way I could have spent the first part of my birthday. I had a celebratory breakfast at McDonald’s on my way home from Irvine. One of my New Year’s resolutions is to give up my McDonald’s Egg McMuffin habit (more on that in a future post), but I made an exception for my birthday. Actually, all of the diet improvements I planned to make in 2016 were postponed until after my birthday. There are some things more important than healthy foods! I was tired after my race and parking myself on the couch for the rest of the day was the most appealing option, but I was meeting some friends at Disneyland that evening to celebrate my birthday. Beforehand I had a dinner reservation at Carthay Circle restaurant in California Adventure. It’s my favorite restaurant in either park. I’ve never had a bad meal there. This time I got a cauliflower salad appetizer, a crispy duck with chestnut gnocchi main course, and a sticky toffee pudding with pineapple sorbet for dessert. It was so delicious! All three of the dishes were amazing. I’m not sure I’ve ever had a better meal at Disneyland. 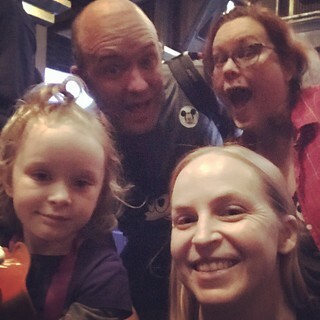 When I finished dinner I met my friends and their adorable kids for some Disneyland rides. Birthday hugs from the three little girls was about the best gift I could have gotten. Even though I didn’t stay for the fireworks that night, I still I stayed up way past my bedtime. But it was worth it. I had an incredible birthday and I can’t wait to see what the rest of the year brings. In an effort to catch up with all of the major things that have happened in 2015 (and to try and satisfy my New Year’s resolution #4), I’m going all the way back to the beginning of the year to write about my trip to Orlando in January. I figured I really needed to finally document that trip before I head back there for the Wine and Dine Half Marathon at Walt Disney World next month! My parents joined me in Orlando for the 2015 Disney World Marathon Weekend (1/7-1/11) when I was running the 10K and half marathon. We stayed at the Coronado Springs Resort which turned out to be pretty nice. The room was basic enough, but all of the buildings are situated around a lake. We had a little bit of a walk to get breakfast at the food court every morning, but at least the lake made for a lovely route. And it was a bit chilly in Orlando that week which was both good and bad. The day before the 10K we went to the race expo at the Wide World of Sports complex and picked up my shirts and bibs for the two events. I was distressed to discover that the race pins I thought I’d ordered (and even had email receipts for) had gone awry during the registration process. Luckily I was able to buy them at the expo, but only after looking in three different places. We spent the afternoon wandering around Downtown Disney (which has been renamed to Disney Springs since then) and had dinner at Wolfgang Puck’s Grand Café. A nice pasta dinner before my first race. The next day was my 36th birthday and we started the celebration by getting up at 2:30 AM to catch the bus to the 10K start line. Doesn’t that sound fun? Believe it or not, I was thrilled to be running a race on my birthday. And despite the fact that it was 45 deg that morning (we hunkered down in one of the event tents to stay warm before the race started), the experience was fantastic. 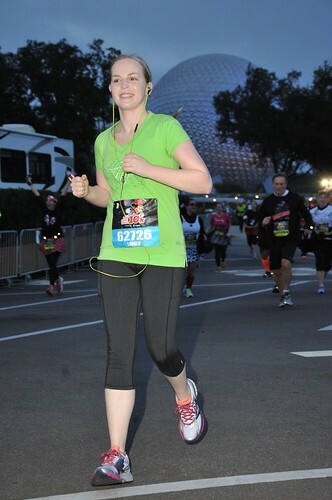 Running through EPCOT was so much fun. My time was nothing to brag about, but I felt great. It was one of those runs that was almost effortless. That doesn’t happen to me very often so I was grateful for such a memorable run on my birthday. After I crossed the finish line my parents and I took the bus back to our hotel, showered and changed, and grabbed a late breakfast. To finish my birthday celebration we went to Disney’s Animal Kingdom Park since I’d never been there before. It was cold and there was a lot of construction going on at the park, but we still had a good time. The Expedition Everest ride is so awesome! I’d go back just for that. And we had a surprisingly good dinner at the Yak & Yeti restaurant. That night we were all tired from getting up way before the crack of dawn so we went to bed early – especially since we had to repeat the same process again the next morning for my second race.